Jasic sponsored, World Number 8, Shaun Murphy kicked off the month with a great run in the 2018 Champion of Champions tournament at the Ricoh Arena in Coventry, where he had a great run to the semi-finals. Unfortunately, the defending Champion bumped into Ronnie O’Sullivan, which can often mean the end for any player and it proved to be the case this time around. The magician also appeared in the UK Championship at the end of November and although didn’t manage to hit quite the same form, with matches from both tournaments being shown across ITV and the BBC, the Jasic brand have enjoyed some great exposure through Shaun this month. 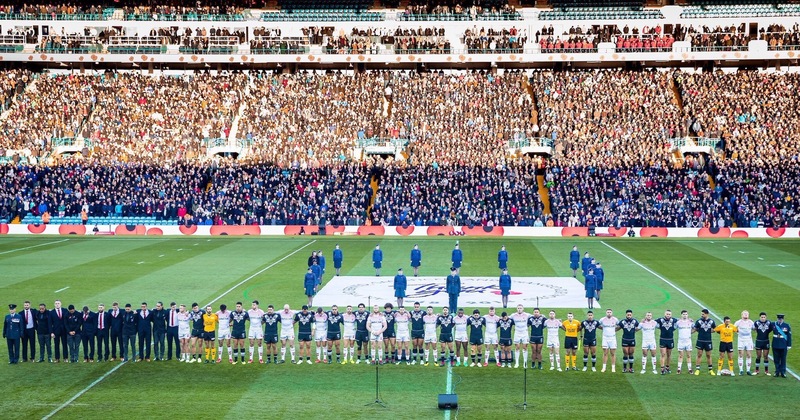 The International Rugby League series between England and New Zealand was next up and we were privileged to be at both Elland Rd and Anfield to witness two great but very different games. England wrapped the Baskerville shield up in Yorkshire, after some pre game inspiration from the armed forces and one of the best minutes silences you will ever see and then The Kiwis avoided a whitewash with a resounding victory on Merseyside. Staying in Rugby League, Wigan Warriors revealed their new kits for the 2019 season and it’s great to see Shearings on the back of this years’ offerings, after renewing their deal as official travel partners. We have a long history of working alongside the Warriors on kit deals and this was another great one to be a part of. Welsh darts ace, Gerwyn Price had an unbelievable month, as he provided the gun powder and fireworks on the 18th of the month, as he somewhat acrimoniously lifted the PDC Grand Slam of Darts trophy, by beating Gary Anderson in an ill-tempered final in Wolverhampton. For the second time this year, the ‘Ice Man’ has won silver ware and generated fantastic brand awareness for sleeve sponsors, Jasic. The England Vitality Roses were back in action on home soil for the first time since winning Commonwealth gold in Australia and a narrow win over Uganda sets the second game of the series up nicely. There was plenty of buzz about the Echo Arena, as not only were the girls playing fresh after their gold medal performance, but they were also doing so in their brand new Nike dresses. The game is growing all the time ahead of the 2019 World Cup and bigger and better deals are being struck all the time. Vitality and Nike being two of the latest. Associating yourself with a fast growing, women’s sport could do wonders for the growth and improvement of your own brand and we are just the people to help. As ever the world of Football keeps us busy and throughout November we managed to get to a whole host of fixtures throughout the Leagues. Hartlepool and Barnet were live in front of the BT Sport cameras in this month and as ever we were on hand to brand and dress Victoria Park in Vanarama colours. We managed to catch a bit of England v Croatia on the box but being able to say, “We’ve Got Every Angle Covered” is non-negotiable. Clients come first and regardless of what might be going on elsewhere, we get the job done to the best of our ability. We managed to see Curzon Ashton entertain Bradford Park Avenue in a very watchable 1-1 draw and then finished the month by taking in the 3-2 epic served up by Salford City and Harrogate Town. Two very good teams who will no doubt be up there when May rolls around. Away from the National League, we saw 32Red Sponsored Preston North End enjoy a bit of form as they defeated Lancashire rivals Blackburn Rovers and took a share of the spoils in the 32Red derby against high fliers Middlesbrough. Another couple of weeks like this and PNE could quite easily find themselves in amongst the chasing pack, such is the nature of the Championship. We had a great night at the James Milner Foundation ‘CarnEVIL’ and even though Liverpool were on the cusp of a huge game against Paris Saint Germain in midweek, it was fantastic to see so many of the midfield maestro’s team mates both past and present lending their support. Ever the showman, Heir Klopp even took to the mic to run part of the auction on what really was an enjoyable night for a truly worthwhile cause. The month ended with our friends North of the border helping to put Scotland back on the European footballing, map as Celtic and Rangers left destiny in their own hands going into matchday 6 next month, after great performances against Rosenborg and Villareal respectively. One more big performance away to Rapid Vienna next month and the Gerrard revolution will be well and truly back on track! November passed without treason or plot but there was definitely gun powder and fireworks at the Grand Slam of Darts and at Ibrox. Hopefully December can bring us cheer!